These filmed live events feature “Specialist Physiotherapists” who are Fellows of the Australian College of Physiotherapy. Each Practitioner performs a patient assessment and treatment of a complex condition within an evidence informed framework (1 hour) followed by a Q and A session exploring the expert clinician’s clinical reasoning (30 mins) , conducted by Jane Rooney, FACP, Specialist Sports Physiotherapist,Titled Musculoskeletal Physiotherapist. 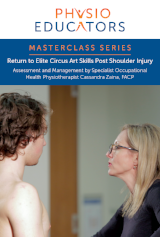 These events are ideal for clinic in-service education activities, physiotherapists undertaking the Specialisation training program, Sports Titling or Masters programs or for those physiotherapists interested in improving their applied clinical knowledge. To enhance clinical reasoning the recorded examination can be paused after the subjective examination and objective examination for discussion of examination findings. The post assessment interview can then be played to reveal the expert practitioners opinion of diagnosis, contributing factors, evidence integrated management plan and patient prognosis. The expert clinician examines the loading history and physical risk factors for this unusual presentation. A Rehab plan is discussed and demonstrated in detail and the patients prognosis explored in the post assessment interview. The expert clinician diagnoses the multiple components of a complex shoulder presentation in a baseball pitcher. The role of the entire kinetic chain involved in a throwing athlete is assessed and a comprehensive management plan demonstrated and discussed. The expert clinician examines the lower limb kinetic chain in a cyclist and explores the risk and contributing factors in the lower quadrant including bike set up and cycling technique. A comprehensive management plan is discussed including cycling specific interventions. 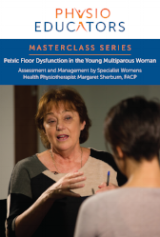 The expert clinician examines pelvic floor dysfunction using real time ultrasound imaging, combined with a comprehensive patient interview and results from a previously performed internal examination in a young and physically active multiparous woman. A management plan is discussed including specific exercises for strength, power and endurance of the pelvic floor muscle group. 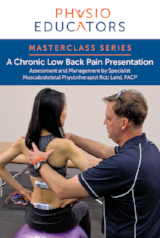 The expert clinician examines the relationships and differential diagnosis of a patient presenting with lumbar spine and hip pain co-existing with anterior and posterior pelvic pain. An evidence informed rehab and management plan is discussed and specific exercises demonstrated. The expert clinician examines the specific dysfunctions in this athlete’s presentation at 8 months post ACL reconstruction and integrates these with contemporary evidence and the clinicians experience to design an appropriate rehab program for a successful return to sport. The expert clinician deferentially diagnoses the presenting headache and explores the risk and contributing factors. A comprehensive management plan is discussed and treatment techniques demonstrated.